ACROSS Scotland, thousands of public sector workers took to the streets in protest at the government’s changes to their pension and working conditions. Though the spirit in which the marches took place was peaceful, and in some cases almost festive, their placards and banners expressed the marchers’ anger and sense of injustice at having to pay for a crisis they feel was not of their making. Beyond the protest, however, a recurring theme raised by individual strikers and the unions was that this was just the beginning of a prolonged struggle – and that if the government did not back down then yesterday’s scenes would be repeated. 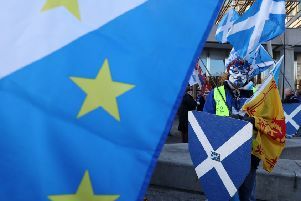 THE mood in Edinburgh was carnival-like, as representatives of nine unions joined for a day of action, and with 99 per cent of Scottish schools shut, many children waved flags and placards from the unions of their striking parents. Yesterday’s march, which began at Johnston Terrace and ended outside Holyrood, attracted about 10,000 people. A blue bus with “Chaplin’s Disco” emblazoned on the side blared out pop music as crowds gathered at noon, and the vehicle later served as a sound system for the delivery of speeches. As she waited for the march to begin, Sheila Adamson, a member of the support staff at Queen Margaret University, said she felt betrayed by the government. “Agreements were made and the government has gone back on its promises,” she said. However, Graham Hall, principal officer for the housing service at East Renfrewshire Council, was less taken with the popular discontent on the streets, despite being a public sector employee. “I’m embarrassed and thoroughly ashamed to see this,” he said. “They all have well-paid jobs with excellent positions and benefits, but they are very misguided and have fundamentally misunderstood the government’s position. OUTSIDE the famed Barrowlands Ballroom, a group of STUC stewards stood by the entrance awaiting the arrival of 5,000 public sector workers and their supporters. Arriving in the city’s east end, the march was led by a troupe of female drummers, lending proceedings a carnival atmosphere heightened by whistles, cheers and air horns. For those who could not get into the 2,900 capacity venue, an overspill hall was organised where the speakers repeated their speeches. Inside the main hall, banners and posters that spelled out the protesters’ frustrations and demands were hung from the walls: “People First”, “No Cuts, Hands off Our Pensions,” “Fair Taxes, a Living Wage, Jobs, Services”. For Linda Hunter, a Glasgow auxiliary nurse, the march was a opportunity to express her anger. “I don’t think it will have any effect, but we have to make our voice heard,” said Ms Hunter. He said that this generation were now “being hit” for the first time and feared being “thrown on the scrap heap”. Addressing the rally, Unite’s Pat Rafferty said public sector workers had been “forced into this corner” by the government. “We’re not going to be mugged by millionaires and billionaires any more,” he told the gathering of demonstrators. MORE than 3,000 pension protesters braved the bitter cold to attend a rally at the Castlegate in the historic heart of the Granite City. The speeches were led by Lewis Macdonald, the Labour MSP for the North-east and transport spokesman, who praised the response to the strike call in the city, saying: “We support your action. What the government is doing to your pensions is just a symptom of what they are doing to the whole economy. One of the biggest cheers of the rally went to Janet Adams, a GMB trade union official in Aberdeen, who said: “The Tories say we shouldn’t be on strike today. What a bloody cheek they’ve got. “If they hadn’t put forward proposals to take money out of our wages to pay for the blunders made by the fat cats of big business and the banks there would be no need for us to take action today. Tommy Campbell, the regional organiser of the Unite union, said the turnout on the picket lines throughout the area was a clear demonstration of the public sector’s opposition to the pension reforms. However, he warned: “It is going to a long haul. We have to recognise that this government isn’t going to back down easily. But if we stick together we will win. STRIKERS in Dumfries picketed local authority buildings, courts, hospitals and the town’s prison before many attended a rally at the Cairndale Hotel. In SHETLAND, about 70 union members braved rain and hail to form picket lines at Charlotte House, Hayfield House, Grantfield and at the Gilbert Bain Hospital. ON LEWIS, about 250 strikers and supporters participated in a march through Stornoway. With schools and nurseries also on strike, many parents took their children along as they waved banners and placards on the route from the Western Isles Council buildings into Perceval Square in the town centre where a rally followed. It was the largest public demonstration seen on Lewis for many years.